Not far from here, in the farming community of Tunbridge, is a group of beautiful farms and this is one of them. The Howes are stewards of the Vermont landscape. 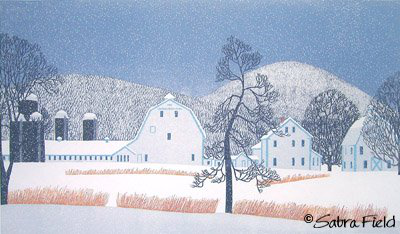 Their Holstein Stock Farm is most beautiful in winter when the pale barns compliment the snow. The Howes even produce organic milk. We are very proud of them! Framed 27" x 41", Unframed 20" x 34"